"We have been with Templeman Ross for a number of years now and like a lot of companies, we had been looking for accountants who would fulfil two functions - those year-end jobs, routine but essential and the forward thinking function. In our mind, any accountant should be able to do the end of year accounts - but what directors of a company need is an accountant who will explain things without jargon, who will talk it through patiently and who will be there at the end of the phone for any questions that a director or book keeper has: that is the type of service that Templeman Ross give. However, the icing on the cake is the forward thinking function; we wanted an accountant who would not just tax plan for us but would also suggest ideas and ways to reduce our tax bill; someone that we could bounce tax saving ideas off - someone who knew us personally, how we think and work. For all those reasons we would highly recommend Templeman Ross". "We are very pleased to write a testimonial for you as we feel that you have provided us with excellent advice and support for many years. The tax planning advice and commercial solutions provided have saved my firm a significant amount of money. Furthermore, we are impressed with the professional level of service that is delivered on a personal and friendly level. 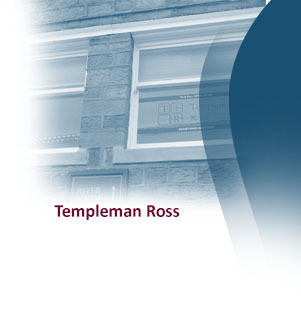 To anyone considering appointing an accountant I believe that Templeman Ross are highly recommended". "As you know, for many years my accountancy and taxation affairs were dealt with by a fairly high profile accountancy practice. However, over time I became concerned about the level of fees that I was paying and some of the advice given. It was timely when we met more than two years ago and I am pleased to say that you have helped my firm keep more of its profits. I also know that your firm believes in maintaining high standards as these are equally important to me. I have no hesitation in recommending your practice to other interested businesses". "Accounting and tax issues are dealt with in clear and concise terms. Templeman Ross focus on ways of improving profits and saving tax". "Robert and Sally Templeman were very helpful when I set up my own practice and have since been supportive and provided very helpful advice when the need has arisen".